1. Give the baker enough notice. More often than not, bakeries tend to fill their schedules quickly at the beginning of each year, as customers request special dessert orders for their important life events and parties—this is especially true during wedding season. It’s critical that brides and grooms give their bakers more than enough notice when ordering their wedding cakes so that there is enough time for the couple to help pick a design, taste test flavors and consult with their baker ahead of time for any and all cake details. Couples usually order a wedding cake for at least one month in advance. 2. Invest in a wedding cake serving set. Since weddings are meant to be the best day of every couple’s life, there are so many details that go into the special day, down to the very utensils used to cut the wedding cake. Since wedding cakes are larger in size, typically consisting of multiple layers, a specific wedding cake serving set must be purchased to cut and serve the cake. These wedding cake knives and wedding cake servers can be passed down from a bride or groom’s parents, engraved or purchased separately to match the other silverware and cutlery that are apart of the wedding reception. 3. Learn about your frosting options. Bakeries provide a wide range of options for specialty cakes when it comes to frosting. Deciding which frosting to go with is a big part of the wedding cake selection process, usually involving a taste test so that the bride and groom can not only see what each type of frosting looks like, but experience how each one tastes as well. Brides and grooms should keep in mind that every frosting has a different taste, texture and overall appearance. The wedding cake frosting options offered at most bakeries usually include fondant, buttercream, whipped cream and ganache. 4. Consider wedding cake toppers. Wedding cake toppers are the final touch on any perfectly constructed wedding cake. Depending on what a bride and groom’s taste is, along with the theme of the wedding, wedding cake toppers can vary quite a bit. Wedding cake toppers are traditionally figurines of some sort that represents the bride and groom. Wedding cake toppers can be funny, sentimental and even include a couple’s pet—they can also display a message of some sort, featuring the bride and groom’s name or a romantic saying. Consulting with the bakery is key since they might have a wide selection of wedding cake toppers to choose from. Otherwise, wedding cake toppers are available in stores and online from certain retailers. 5. Create a reasonable budget. While countless bakeries create wedding cakes, not every bakery has the same pricing. 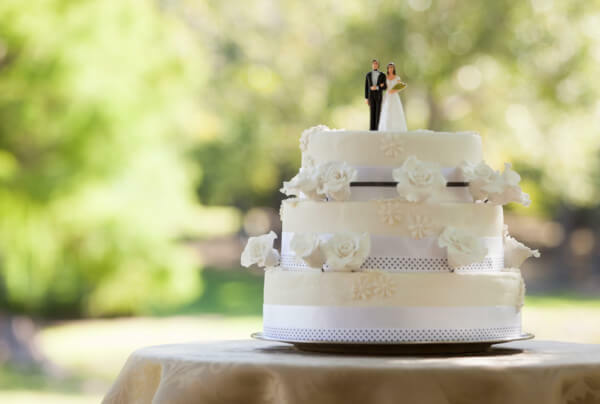 Brides and grooms must establish a realistic budget and follow it wisely, making sure that they are seeking out bakeries that will be able to provide quality wedding cake services that match their price range. Finding an affordable, reliable bakery is key for brides and grooms who are in the beginning stages of searching for professionals who will bake and decorate their wedding cake. An internet search and word-of-mouth referrals are two great ways to go about finding a bakery that coincides with a couple’s budget. No wedding is complete without a wedding cake. Brides and grooms that reside in the New Jersey and New York areas should look no further than Calandra’s Bakery for their wedding cake—a business that has been delivering freshly baked goods to the community for over 50 years. Interested engaged couples planning a wedding should contact Calandra’s Bakery by filling out an online form to learn more about the specialty wedding cakes.